So you've got a potential fixed gear convert. He loves riding your bike, laughs at all the witticisms that go with fixie culture, and is enthusiastic about getting his bike set up for proper fixed riding. Unfortunately, his bike has vertical dropouts. 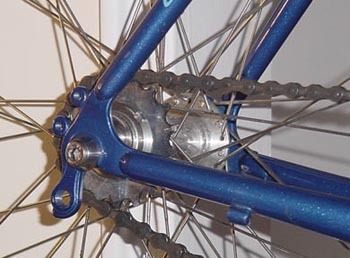 Fixed gear bikes usually have horizontal dropouts, so that the wheel axle can be moved fore and aft to achieve appropriate chain tension and allow the gears to engage correctly. Bikes with vertical dropouts have fewer options for achieving chain tension, because they typically use derailleurs. 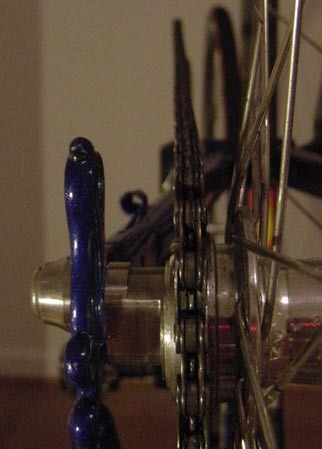 Derailleurs don't work on fixed gear setups because back-pedalling would overpower the tensioning spring. "Typically," however, is not the term to use when talking about White Industries' Eccentric ENO hub. The Eccentric ENO features axle bolts that are off-center by 7.5mm, allowing you 15mm of axle displacement. Since modern chains have about 13mm between links, you're guaranteed perfect tension regardless of gearing. The ENO comes in spacings of 126, 130 and 135mm, with 28, 32, and 36 hole drillings available. It is set up to give a chainline of 47.5mm, which sits a little inward of my chainring with my 113mm bottom bracket. As you can see from the picture though, it's hardly anything to complain about. In fact, I had always assumed that my chainline was perfect, and only when I looked very closely from the perspective in the picture could I discern the angle. My initial impression of the hub was that it was a little weird looking. Most people probably wouldn't notice, but I'm only interested in attracting the attentions of the cognoscenti anyways. I built it up three-cross on both sides (it is a flip-flop after all) to a Mavic Open Pro. Everything on the hub is aluminum, save the axle flats and bolts, which are stainless steel. It rolls on some pretty decent cartridge bearings, and manages to do so for a long time--the hub so far has lasted completely problem-free through many hundreds of miles of muck and dust and water, with no end in sight. To tension the Eccentric ENO, you have to familiarize yourself with a few nuances. The first is that rotating the axle moves the wheel up and down relative to the rest of the bike. If you've got a strangely proportioned frame--for instance, an unusually low brake arch--then this might be a consideration. Brake pad position will change too, but for most fixed gear applications this will be irrelevant. 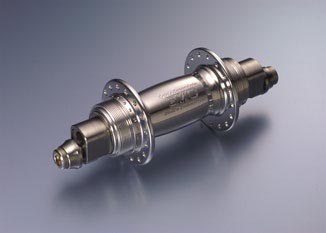 As it stands, none of the frames on which I've used this hub have experienced any problem. Secondly, the actual process of rotating the axle to attain tension can be a bit tricky, because as you increase tension the wheel wants to move forward, and it does its best attempt at it by coming out the dropouts. Usually though, you can pinpoint the tension at which the wheel begins to pull out and slack off a little, putting you right at a very nice tension. I find that it's easier to rotate the axle using an adjustable wrench on the flats, especially in frames with tight clearances. The wrench also gives you more leverage, although using it may make you go overboard by making the whole operation seem more difficult than it really is. There is technique to it, but technique is what makes life worth living. At the very least, you won't have to worry about aligning the wheel in the dropouts. One final note regarding the hub is that, throughout the entire process of buying and owning the hub, the people at White Industries have been super nice and very helpful. There was a bit of a shipping snafu initially with my hub, and Doug White, the man himself, called me up, explained the situation, and told me it was being corrected. Also, I ordered a pair of 130mm axle ends which didn't quite fit properly. They sent me not only another pair of ends but also another axle, free of charge, just to make sure everything would work right. A class act. Final verdict: Well-executed, elegant solution from an excellent company. Perfect for that road frame that you've been wanting to fix. Craig Durkin lives in Atlanta. He commutes daily on a fixed gear and rides trials the rest of the time. UK fixers can source the ENO and other fine kit from 63xc.com's e-com spinoff, Hubjub. Visit the White Industries site to learn more about the company's products.